Into the second day. Photo by Beat Jegerlehner. Wind ripped over the ridge, blasting us in the face with coarse particles of sand. It was pitch dark; no comforting glow of light pollution could be found, and the stars were obscured by the dust cloud swirling through the air. True to the desert, the night became quickly cold, and we made it to the upper reaches of the Pink Cliffs just in time to pull on long-sleeve shirts, puffy coats, and beanies. I insisted on changing my socks again and Beat used the time to scour the aid station for something warm to eat. The table was covered in red dirt but otherwise blown clean — there were a few petrified peanut butter sandwiches, and some gritty potatoes. The wind was blowing gale force and the chill while sitting still felt Alaska-like — except for instead of snow, the blizzard was made of sand. Three exhausted-looking teenagers huddled beside a flapping tarp, looking slightly shell-shocked. "They're probably very nice Mormon boys and this is a service project they got roped into," I thought. "Poor kids." I skipped eating at this aid station. I was not interested in ingesting more sand, and Beat had supplied me with a bag of candied ginger. The thought of this stuff was revolting, but when I put a few pieces in my mouth, the ginger pieces temporarily quelled my nausea, and there were enough sugar calories to produce a tiny buzz. Still, I didn't realize how much I'd come to depend on the 300-odd calories I was forcing down at my previous aid station stops. As we started down the descent, I became quickly woozy, wobbling about on a 30-degree pitch that skirted the edge of vertical cliffs. Wind whipped around and I held my hand over my eyes to shield the sand blast. In a more competent state, I probably would have been frightened, but this slope wasn't so bad. I'd have to stagger off-trail for some distance to actually go off the edge, and if I fell forward maybe I would get lucky and crack my head open, and then I would be forced to stop. I saw a sparkle of city lights that made me smile. "Oh Panguitch, the highway town that time forgot. But I haven't forgotten you, and I wish you were up here." Fatigue seems to saturate my sentimentality. But as I moved my headlamp away, the lights disappeared, and I realized they weren't lights at all. Were they ... eyes? "Coyote? Mountain lion?" I wondered with surge of fear. My mind shaped these vague sparkles into into cat-like eyes, and even when I couldn't find them again, I became convinced a lion was stalking me. But just as quickly, I threw my own doubts into the fire. "Maybe it was Lynx," I wondered. I've written before about my favorite hallucination. Ever since that night, I sometimes visualize "Lynx" in times of sickness, fatigue, and fear. The image of Lynx is a source of comfort to me, a kind of watchful spirit that I conjure when the lines between dreams and reality begin to blur. A few days earlier, my sister and I took my 3-year-old nephew Max to the zoo. Between Max's rushing from the rhino to the reptile house, I lingered for a few minutes at the pen of the Siberian lynx as it crouched in a thin patch of shade, looking rather uncomfortable under the Utah sun. Lynx had been on my mind, and I wondered if I was far gone enough to start actually "seeing" Lynx. "I need to eat some more calories," I thought. The night miles trudged along without notable differences; I think that's perhaps we only covered about 25 of them while it was dark. I couldn't even tell you how we moved that slowly, but we huddled in our multiple layers of clothing and were glad to have them, because our bodies certainly weren't generating great amounts of heat. Beat had decided earlier in the day that he would stick with me for the remainder of the race, and I'm grateful he did. I always tell myself I prefer to take on these efforts alone, but the morale and confidence boost of having him nearby did wonders for keeping me grounded. Otherwise, I might have given up the ghost the minute I started imagining Lynx. Still, I felt guilty about holding Beat to my slow pace. "It's your birthday," I insisted. "You should do what you need to do." "It's not my birthday anymore," he reminded me. It was now sometime in the quiet hours before dawn, where the cold wind was fierce and sand filtered in and back out of my phlegmy lungs, but everything else stood still. We were working our way back along the rim of the Paunsaugunt, barely breathing. Back at Kanab Creek, mile 66, we sat down for a long time. The fire was so inviting and the teenage volunteers were jovial and lively, a pleasant surprise at what must have been after 3 a.m. Runners always appreciate the volunteers in these races, but I have to say the young volunteers at the Bryce 100 were especially refreshing. "It's against their religion not to be super nice to us," I joked with Beat, but really, when you're a smelly and grumpy adult in the midst of an illogical pursuit, it's gratifying to hear the friendly voices of normal kids. I didn't really care if they served me a cup of noodles or refilled my water bladder (which they did), I just wanted to hear them tell their jokes around the campfire and reminisce the time in my life when I was a nice and normal Mormon kid staying up all night with my friends and a raging campfire. Oh, what happened? "This could be you someday," I wanted to tell them as they looked on with bemusement while we slumped in their camp chairs. "You probably won't believe me now, but it could. And you don't know it yet, but you're going to love it." After we lingered in the chairs for about 20 minutes, a volunteer mentioned that because it was mile 66, we could quit there and the race director would still give us an official 100K finish. That statement jolted me out of my stupor. "No," I cried out. "No!" I'd come too far to toss it in now. This isn't a statement of judgement for those who took this option. I completely understand and respect anyone who went the distance on this deceptively difficult course. But that wasn't the right option for me. I did not want that. 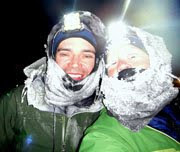 We picked our way back to the Blubber Creek aid station, mile 75, right at dawn. At this point, I was assessing my chances against the cutoffs. We had 12 hours to cover 25 miles. It seems imminently doable, but at this point, I was not so sure. 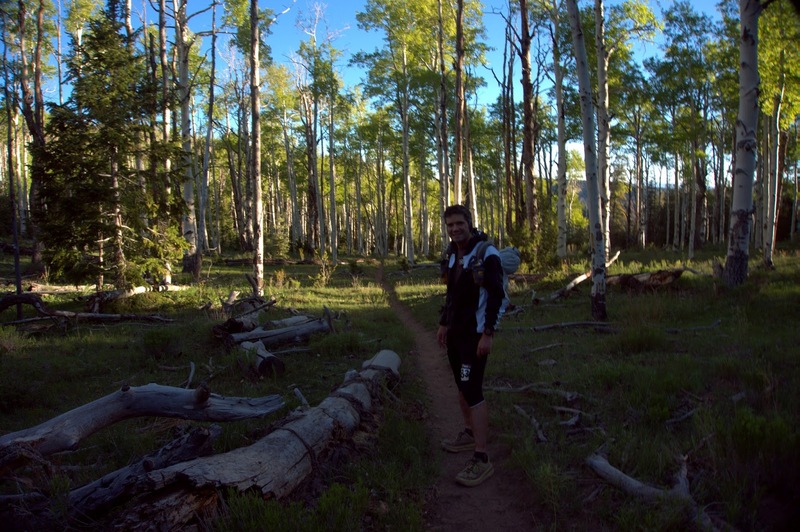 "It's six miles to the next aid," Beat assured me, "and mostly downhill." "The longest miles," I lamented. A lot about the Bryce 100 already flickered in the shadows of my memory. But I sharply remembered the canyon that broke me — the first time through. The thing about that canyon segment is it's not mostly downhill — it starts around 9,000 feet and ends at that level, with relentless steep and rocky descents and climbs in the middle. The final climb to the aid station gains 1,500 feet in a mile and a half, and this is the point where I actually started to feel better about the whole situation. The sun was coming up, the candied ginger was fueling my flickering awareness, and this trail was ridiculous. Absolutely ridiculous. When I looked at my watch, it was clear that this six-mile segment was going to take three hours to cover, and that was ridiculous. There was no way we could finish this ridiculous race within its ridiculous time cutoffs if it continued at this pace of ridiculousness. I sometimes falter in moderately tough conditions, but mentally I can better handle ridiculous. If something is impossible, there's no reason to get worked up over it. However, Beat was still insistent on remaining with me, and he was adamant about not getting cut from the course. "I've come too far to miss time cutoffs," he told me sternly. He was right, but my determination was flagging. "I try," I mumbled like a child trying to stave off a lecture. "I try my best." But Beat was right. I don't like it when he tells me something I don't like to hear, but it needs hearing. I needed to pick up the pace. At Proctor Canyon, mile 81, I made a effort to eat something solid and ended up inhaling an entire banana pancake with grape jelly. I was starving, famished, but it was difficult to reconcile that hunger as long as I kept moving and breathing hard enough for nausea to take over. By the time we left, my energy levels felt renewed and resolve returned. I was going to *run* I insisted. I would run the rest of the way. "Let's finish this thing." Perhaps unsurprisingly, simple resolve wasn't enough to propel me forward. Beat insisted we take a mile of walking to let the big breakfast settle, and then we tried jogging. My gut jostled around and I felt quickly winded and light-headed, but I tried to ignore it. "You want to run," I encouraged my faltering body. "You need to run." But sometimes (most times?) body doesn't care what the hell I think, and won't do what I tell it to do." I became so dizzy and nauseated that a bit of my breakfast came back up, and I did the wrong thing in choking the bile back down, thereby feeling the most awful I'd felt yet. I could feel it gurgling back up — not my breakfast, this time, but the obligatory temper tantrum. The embarrassing loss of composure that seems to arise in every hundred-mile race I attempt. Tears started spilling out. "Don't worry," Beat tried to comfort me. "We still have time." "It's just, it's just that," I blubbered. "I don't even know why I'm so upset. I don't even know why I'm crying about this. Honestly (gurgle gurgle) I don't feel that bad." "That's just the ultra effect," Beat assured me, and that truth made me laugh through the bawling. Isn't it funny that simple physical imbalances can have such a strong effect on our emotional states? We think that deep emotions are unique to our minds, to our souls, to that individual awareness that makes us who we are — but our rather fragile and somewhat embarrassing bodies keep a strong chemical harness on our feelings, after all. The fact that being bonky and tired could make me feel so upset only reminded me how much control over my emotions I really have. "Maybe I can't run," I thought. "But it's still a nice day, and I'm in the beautiful Utah desert hanging out with Beat, and damn it, I'm going to enjoy the rest of this." 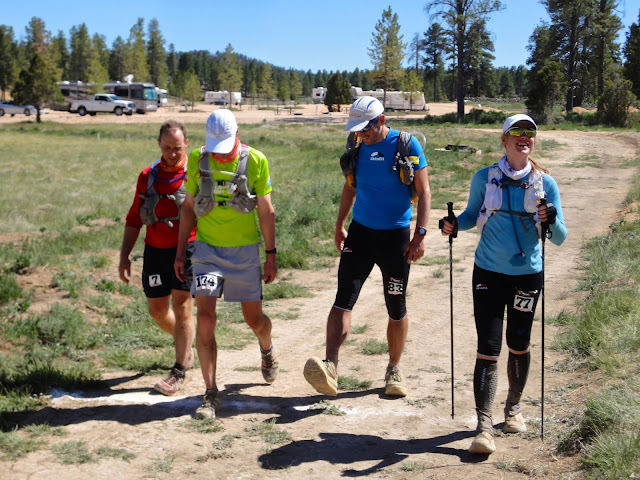 At the final aid station, I was still holding out for the hope that "I'll start running with my stomach settles" when we encountered our friend Harry. He'd been sitting there for what was probably quite a long time, and informed us that he was seriously considering dropping at mile 90. It was late morning at this point, and the temperature had shot back into the eighties. All of us had been out all of the previous day absorbing unfiltered UV rays at these high elevations, our systems were fatigued, and our bodies were cranking out vast amounts of heat even as our core temperatures fluctuated wildly. Harry was genuinely concerned about heat stroke; there hadn't been much shade during the previous 10-mile segment, nor would there be for the next unknown number of miles (it was supposed to be 11, but we were already suspecting longer.) This was the last refuge of support; there was one unmanned water jug somewhere along the course, and beyond that we were on our own — at the pace we were moving, possibly for as long as four hours in the heat of the afternoon. Harry decided to continue toward the finish with us, even though I warned him that I might not be able to run another step of the race. I had reached my Zen acceptance about it and decided I was going to engage the cruise control, kick back, and enjoy the views. The main issue with this last section of Bryce 100 is that, unlike the entire rest of the course, there were no more views. 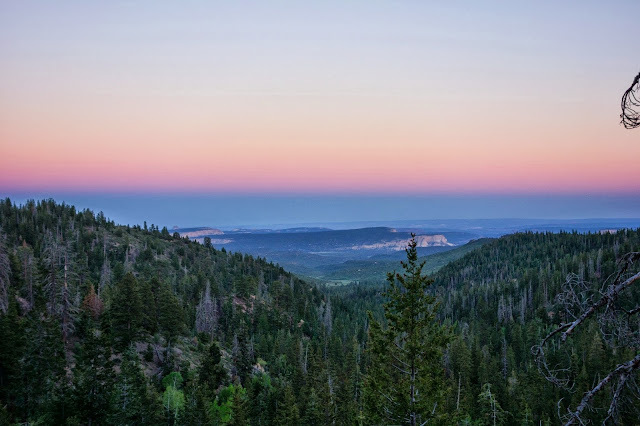 We were on a long stretch of jeep road descending slowly from the high plateau, and basically it was just a flat, open valley sparsely forested with ponderosa pines. The shade these trees provided was thin at best, and we picked our way from shade patch to shade patch, sometimes taking sitting-down breaks. The desert heat and sun triggered my water paranoia, and I was taking frequent rationing sips and panicking about my water supply even though I was already hydrated enough to need to stop and pee every twenty minutes. At the final water stop, our friend Steve caught up to us after rallying back from his long, hard night. He agreed to walk it in with us, and the group dynamic of grumpiness, silliness, and toddler-like emotions was downright humorous. I'm not sure how I would have found enjoyment in this final stretch if it hadn't been for Steve, Beat, and Harry, but the four of us commiserating together was greatly satisfying. 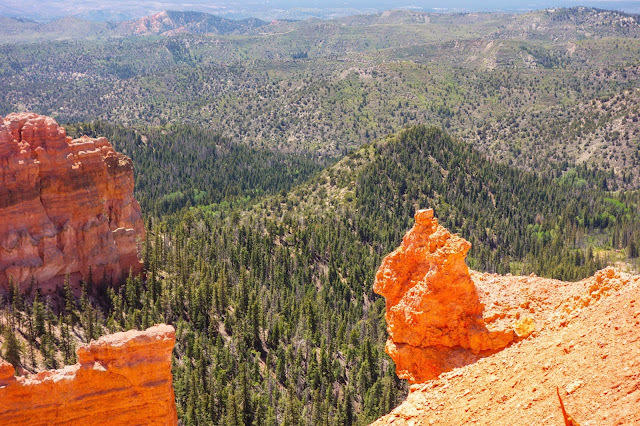 The Bryce 100 was back to being ridiculous again, and I got a kick out of our lengthy arguments about GPS tracks and how these data points defied the apparent eternity of the jeep road slog. 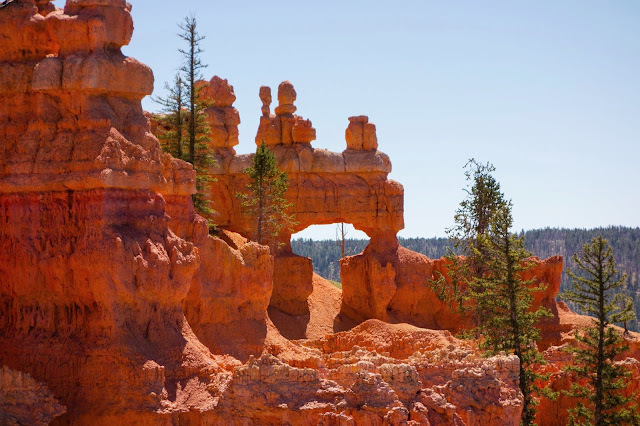 In a way, the Bryce 100 could have been a somewhat disappointing experience. There was a high ratio of malaise to joy compared to even my other tough foot events such as the Susitna 100. Beat captured better photographs than I did, and I finished in 34 hours and 24 minutes after starting the race convinced I could go sub-30 in this one. But it doesn't feel disappointing at all. 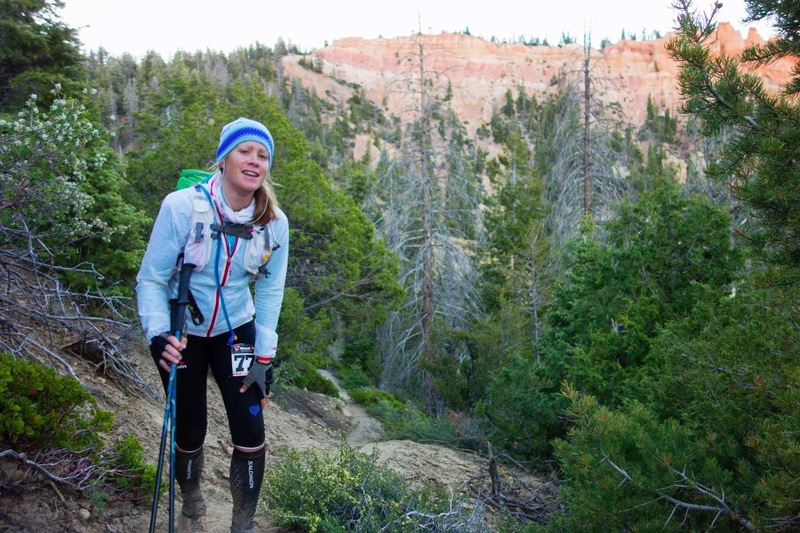 For me, the most rewarding aspect of the Bryce 100 was feeling so low for so much of the race, and pressing through anyway only to finish with a wide (although crooked with exhaustion) smile. In the end, I can't gain as much satisfaction from mundane numbers or parsing out my current level of athletic mediocrity, as I can from engaging in a truly challenging personal battle and emerging on the other side, wiser. Oh, God. I know that feeling! You captured it beautifully. I'll think back to this post as I am doing the Bighorn 100 next weekend (June 14-15th). Congrats on your finish!!! Wow - great job! You and Beat continue to amaze me. Phenomenal job getting it done. At some point you all crossed paths with us and hopefully we, in all our silliness, brought some joy back to you (we were the boys of Altra). Congrats on a great finish. You have the heart of a lion Jill. Don't ever underestimate yourself. Congratulations on finishing the race with a smile! That shot wasn't staged, or, at least, it was only partially staged. It was so hot leading up to the finish that we stopped to all get caught at one final shade spot. Beat was a little ahead so when he turned around he found the three of us bent over just like this. He told us to hold the "pose" so he could get a shot. Congrats on finishing what seems like a super hard race in a super nice place. My wife suggests wrapping your flesh in ivy an in twine as the best way to recover. First thought when I saw the photo of the four of you crossing the finish line. Dorothy, Tin man, Scarecrow and Cowardly Lion. Where is Toto? Awesome post. Impressive job hanging in there. Still getting used to the heat here too. Looking at that last picture, Beat has quite a pair of gunboats, doesn't he? It's official.....one of the most beautiful, well-written race reports I've ever read. You captured every detail perfectly. It was a pleasure to spend some time on the trail with you! Congratulations! Sounds awful but a great memory (to have behind you). It doesn't have to be this way. It doesn't have to hurt so much. The answer is preparation. How many 50, 60, 70 mile weeks did you put in in the last year in preparation? How do you expect to do well on the final exam if you don't go to class and do your homework? Great report Jill. That last "ten" miles was brutal! I don't run many high-mileage weeks because I'm not exclusively a runner, and I never will be exclusively a runner. But, I do think I was in decent shape for this race. I ran a 50-miler and several 50Ks in the weeks prior with few issues, and a 100K back in March. There are *so many* variables to a hundred mile event that it surprises me that so many people cling to cut-and-dry formulas. High altitude? Possible bacterial or viral illness? Travel fatigue? Nah, must be because I didn't arch my training plan properly or run 100-mile weeks in preparation.